Holden has claimed the 2015 V8 Supercars Manufacturers Championship, capping off another record-breaking season on track. It is Holden’s 11th manufacturers title and sixth straight crown – both series records – the past three coming in the ‘open’ manufacturer era. Holden’s Commodore won 19 of the season’s 36 races with victories shared between Red Bull Racing Australia, the Holden Racing Team, TEKNO Autosports and Brad Jones Racing – a dominant end to the year seeing 12 victories in the last 13 starts. The wins took VF Commodore’s total to 74 championship race victories in just three seasons, second on the all-time most winning car list behind VE Series Commodore (103). GM Holden Sponsorship and Motorsport Manager Simon McNamara accepted the award at Monday night’s annual V8 Supercars Gala Dinner and Awards ceremony, praising the efforts of Holden’s teams. 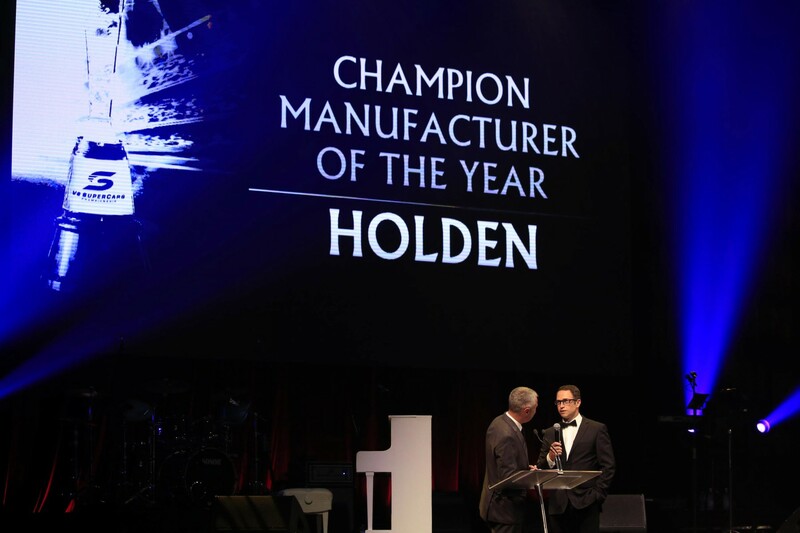 “2015 was a roller coaster year but our ability to bounce back ensured Holden won an unprecedented sixth straight, and 11th overall manufacturers title,” McNamara said. Holden’s success carried into other award categories, with Red Bull Racing Australia accepting the team’s championship, and the Holden Racing Team voted the Best Presented Team for its array of liveries during its 25th anniversary season. Holden hero Craig Lowndes won his fifth Barry Sheene Medal for being V8 Supercars’ best and fairest, with Lowndes also voted the Most Popular Driver in the Fans’ Choice Awards. Team 18 Commodore driver Lee Holdsworth also picked up the inaugural Driver’s Driver Award voted on by his peers. Holden teams won four of the season’s five major events – the Clipsal 500 in Adelaide, Castrol EDGE Gold Coast 600, Coates Hire Sydney 500 and Australia’s great race, the Supercheap Auto Bathurst 1000 at Mount Panorama – while HRT’s Garth Tander and Warren Luff having taken out the coveted Pirtek Enduro Cup.